Fresh fish of the week Pike fishing in January, is it a happy new year? 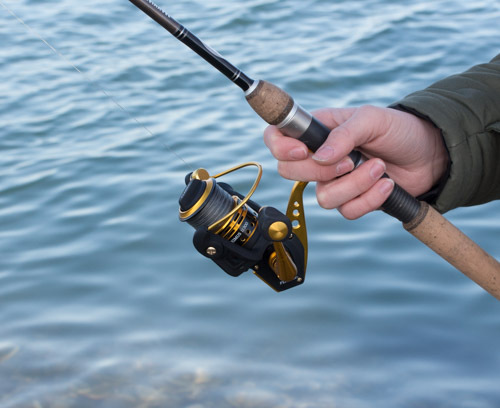 Is it possible to buy a good spinning or lure reel for under £50? 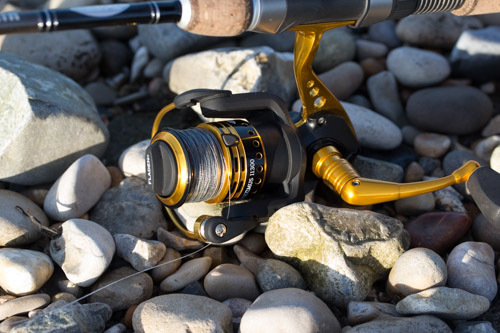 In this review we are going to take a look at the Fladen Maxximus 11300 reel, and see if it can step up to the mark. The main question is how you define the term “good”. For some it may be a reel that is dependable, that you can use occasionally for years, and it works every time you take it out the shed to go fishing. For me to define a reel as good, it has to take a lot of abuse and still maintain all the characteristics that it had when I first bought it. By that I mean the gearing should still be smooth, the anti reverse should still work, the handle can still fold in and it doesn’t look too shabby. The latter probably being the most difficult to achieve, as I really do not look after my gear. The only time my gear gets washed is when it gets rained on. Everything just gets stuck in the boot amongst all the rest of the rubbish in there. The Maxximus name is regarded as the flagship name in the Fladen product line up. The title 11300 or 11500 indicates that the reel has 11 ball bearings and the 300 and 500 part indicates the size. We are review the 11300, which is a 3000 sized reel. This is typically the most common sized reel in use by lure fishermen at the moment. Lets start by taking a look at the cosmetics of the reel. It is finished in black and anodised gold, giving it a modern but not too blingy look. The Anodising on the handle, reel foot, spool and bail arm, is of a good quality, though as you would expect after months of use, it is starting to show some scratches. The amount of anodising must be reasonable, as none of the scratches are showing through to the metal underneath. Most of the main body and the rotor have a rubberised coating, which gives extra protection from wear and helps keep that new look for longer, even in my bag. Talking of bags, the reel comes in a nice cloth bag, but as usual I discarded mine sometime after the first use. As a 3000 sized reel it is perfect for most UK lure fishing applications, but it’s not just a spinning or lure reel. This reel can be used with a number of set ups including float fishing and ledgering in both salt and fresh water. I have coupled it with lure rods between 7ft6 and 11ft, with casting weights between 5 and 60g, and in all occasions I found the reel remained well balanced, even at the extremes of the lengths. I think the same could not be said if you moved up to a heavier or longer rod than 11ft, and if you were to try using it for LRF or ultra light fishing you would struggle with balance issues. It is quite difficult to start talking about unique features on reels, as to be honest most reels have a very similar make up. However there are a couple of features that I like on the Maxximus. By machining several holes in the leg, the designers have been able to reduce the weight of the reel, whilst still maintaining strength. The same has been achieved on the the spool. The handle is made of lightweight but strong aluminium. It folds down really easily by simply pushing on a spring loaded locking collar, and a simple flick locks the handle back up again. The handle can easily be swapped for left or right handed use. The spool is fitted with a line clip, which is nice and flush, preventing any line accidentally catching under it. It has shown no signs of wear and thankfully as the edges are not too sharp I have had no problems with line damage when I have used i t to secure the line. So how does the reel perform? I have been using the reel for more than 3 months now, and although that doesn’t sound much, it is probably about a years use by an angler that gets out once a week on average. The 11 ball bearings make the reel incredibly smooth and the balance through the handle when you free spin it is exceptional. I have picked up reels that cost more than £200 and can honestly say they feel no smoother. Even after a lot of use and abuse by me, including several dunkings in salt water the reel is as smooth now as it was when I took it out of the box. I have never had the bail arm close on me during a cast, and it snaps into place every time I engage it. As a habit I normally manually close the bail arm, as I have found this is one of the first components to go on a reel. In this case I have tested in by continually engaging the bail arm through the handle, and I have yet to detect any wear in either the handle or the bail arm. The front drag is easily adjustable and operates smoothly. I like to set the drag on my reels to around 30% less than the breaking strain of my line, allowing myself the ability to turn the drag up close to the breaking strain in a half turn. On this reel I needed just over a half of a turn to achieve that, although it does take quite a few turns to lock it out completely, but at this stage I am trying really hard to find faults, in what is otherwise a superb reel. There is only one other negative I can say about the reel and that is that it does not come with a spare spool. As I like to swap between braid and mono, I like to have an additional spool, but at the price point, I can’t expect everything. I have included a short video of the reel, which just shows a few more details and the reel in use. 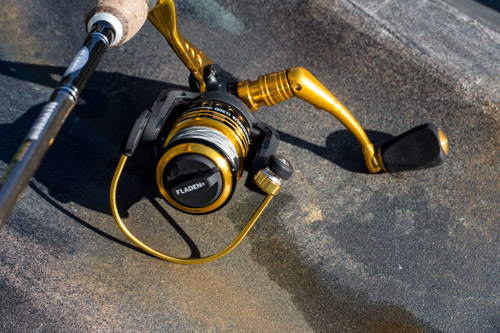 Fladen make no claims that this reel is salt water proof, and only a much longer period of use will tell whether this will be a future problem, but if you want a saltwater proof reel, you will really have to dig a long way into your wallet. I think this is by far one of the best value reels on the market and stands way above almost everything else in the sub £50 price range. It certainly falls into the “good” reel category in my opinion. Light weight, looks good, very durable, Fantastic value for money. 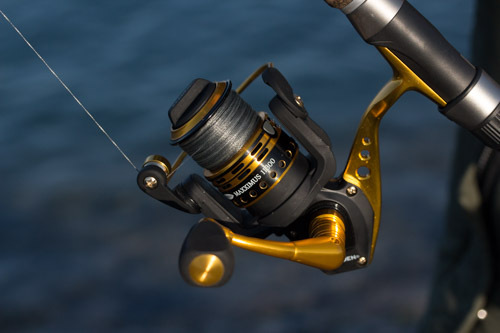 With the price gap between mid and top of the range reels increasing at an alarming rate, the Maxximus 11300 gives you a reel that is in the lower end of the mid range price bracket, with a smoothness and durability, that you would expect in a reel at least twice its price. It does make you wonder sometimes, why you would want to pay more. 5 Responses to "Fladen Maxximus 11300 Spinning Reel review"
What is the weight of reel in grams? Great article. Would it be ok for some light line plaice and lure fishing from a boat. It would be perfect for that martin.